Republican presidential candidate Donald Trump retweeted a bogus graphic purporting to show the percentage of whites killed by blacks and other homicide data delineated by race. Almost every figure in the graphic is wrong, some of them dramatically so. Trump’s Twitter account retweeted the graphic on Nov. 22 without any explanation. The image shows a man hidden behind a bandanna pointing a gun under the heading “USA Crime Statistics — 2015” and next to statistics that purport to show homicides by race. We’re not going to speculate about how originators of the graphic may have twisted data to come up with incorrect figures, or what intent may have been behind those errors — though others have. We’ll just provide some correct figures according to the latest data available on all homicides from the Federal Bureau of Investigation’s Uniform Crime Reports data, for 2014. The 2015 data won’t be released publicly until the fall of 2016. Blacks killed by whites: 7.6 percent. Whites killed by whites: 82.4 percent. Whites killed by blacks: 14.8 percent. 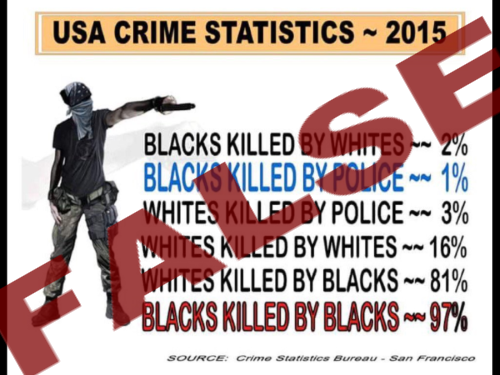 Blacks killed by blacks: 90 percent. As those figures show, the graphic’s claims about “whites killed by blacks” and “whites killed by whites” aren’t just a little off — they are grossly inaccurate. The data from 2013 is nearly identical, so none of the 2014 figures is a one-year anomaly. The 2015 data won’t be released publicly until the fall of 2016, a spokesman for the FBI’s Criminal Justice Information Services Division told us. The Guardian has been keeping a running tally in 2015 of people killed by police, through its “The Counted” project. According to the Guardian, 1,024 people have been killed by police in 2015 through Nov. 23. This is the racial breakdown: 509 white, 261 black, 164 Hispanic/Latino, 59 other/unknown, 18 Asian/Pacific Islander, 13 Native American. Another site, KilledByPolice.net tracks people killed by U.S. law enforcement officers. According to its tally, 1,066 people in the U.S. were killed by police this year as of Nov. 23. The site does not list race for many of those people, but among the ones it does, the site counts 280 black people killed by police this year compared with 437 white people. And finally, the Washington Post tracks people killed by police officers, a tally that stood at 878 this year as of the date of this posting. Of them, 417 were white and 224 were black. The site also tracks those who were black and unarmed — 30 so far this year. Peter Moskos, an associate professor in the Department of Law, Police Science, and Criminal Justice Administration at John Jay College of Criminal Justice, applied FBI homicide averages from 2010 to 2013 to the Washington Post data to estimate that 4 percent of all black homicide victims are killed by police, while 10 percent of all white homicide victims are killed by police. It is, he allowed, a rough estimate. Moskos said those figures are shocking, “but not quite right” because of the different ways that agencies report the Hispanic label. We reached out to the Trump campaign for backup for the figures cited in the graphic. The source listed on the graphic itself is “Crime Statistics Bureau — San Francisco,” a nonexistent agency, as far as we can tell. (Moskos said there is no such thing.) We also asked for the origin of the graphic. If we hear back, we’ll update this piece. Last month, a Trump retweet caused a bit of a stir after someone with access to his account retweeted a message to explain a dip in the polls that said of Iowans. “Too much Monsanto in the corn creates issues in the brain,” it said. Trump later tweeted that the intern who “accidentally” sent the message “apologizes.” No word yet on whether Trump — who boasts that he does a lot of the tweets personally — is responsible for retweeting the bogus crime graphic. O’Reilly: When you tweet out a thing, and this bothered me, I gotta tell you. You tweeted out that whites killed by blacks, these were statistics you picked up from somewhere, at a rate of 81 percent. And that’s totally wrong. Whites killed by blacks is 15 percent, yet you tweeted it was 81 percent. Trump: Bill, I didn’t tweet, I retweeted somebody that was supposedly an expert, and it was also a radio show. O’Reilly: Why do you want to be in that zone? Trump: Hey, Bill, Bill, am I gonna check every statistic? I get millions and millions of people, @RealDonaldTrump, by the way. Trump: Well, this was a retweet. Bill, I’m sure you’re looking out for me, everybody is. This was a retweet. And it comes from sources that are very credible, what can I tell you. O’Reilly: I told you, you shouldn’t retweet ever. You shouldn’t be tweeting. Give it up for Lent. Trump: … Can I tell you what, I like it because I can get, also, my point of view out there. And my point of view is very important to a lot of people that are looking at me. Previous StoryEthanol: Higher Emissions or Lower?